Tasty? Excellent. The Amphipod has become my go to hydration belt for long runs, and by that I mean anything at six miles or more. Since I am my own trail support at the 6 mile mark I have a hydration and nutrition plan that starts at 3 miles. The Amphipod lets me carry water and gels with no issues and the water bottles snap in and out even at a good pace. The other cool thing about the Amphipod is that you can add pockets or bottles based on your needs. I have done just that, adding another pocket to haul my cell phone and using the rear pocket for gels and trash. 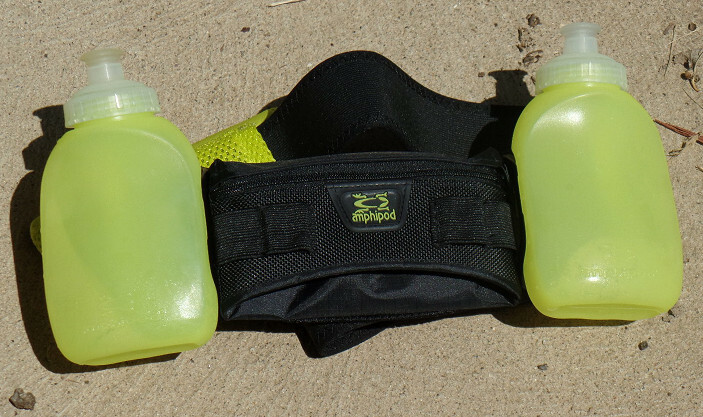 If you’re looking for a good solid hydration belt that can adapt as your needs change, I highly recommend the Amphipod. Next Next post: Feels like a Patellar issue, but might be the IT Band – Does not matter Pro-tec is awesome!